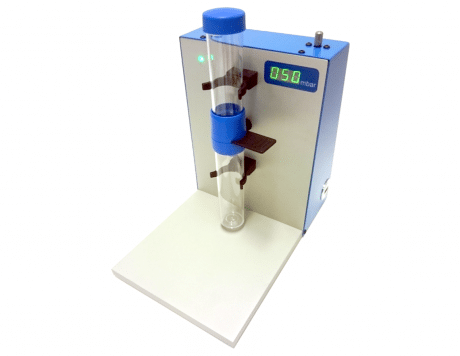 Distribution of single viable cells in individual wells is easy with the Pump-unit in combination with the single cell disposable. Distribute and sort viable single cells in the wells of the microwell chip. The chip is mounted in the slide of the single cell disposable and contains 6.400 microwells. After a short wetting procedure it takes 5 to 10 minutes to distribute single cells from a cell suspension of 1-40 ml across the individual wells. The Pump-unit creates a negative pressure at the waste side of the disposable. The system has an adjustable pressure from 0 – 250 mbar. There is a display that display the used pressure. Different cell suspensions may require different pressure settings. For viable cells the used pressure is typically only 10-20 mbar. Cells in culture medium can be sorted in the microwells and kept viable. Depending on the cell-type, cells can proliferate in the microwells after sorting the viable cells. Different protocols are available to proliferate viable cells in the microwells for research purposes. It is advised to keep the filtration system in the flow cabinet at all times to improve sterility. VyCAP can offer a Puncher in a flowhood to improve the sterility while selecting and isolating cells.